When the producers of Bing Live, Minor Entertainment, were looking for a venue to photograph the stars of the show - the puppets Bing and Flop - they could think of none more beautiful than the Alhambra Theatre, Bradford which the show will visit on 10 and 11 July 2018. Minor Entertainment took the opportunity to give some “Bingsters” the chance to meet the CBeebies favourites, running an exclusive competition with Pulse FM for one family to meet the characters. 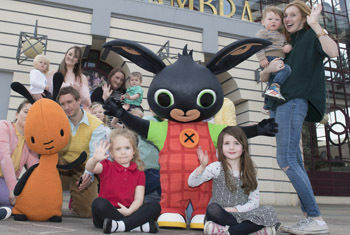 On Monday 9 April, Bing and Flop with a team of helpers took the train from London to Bradford and had a wonderful day at the Alhambra Theatre, with a special guided tour of the theatre followed by a meeting with some lucky Bingsters! The Pulse FM competition winner was birthday girl, Gracie-Mae, who celebrated her 5th birthday by meeting Bing and Flop, along with her little sister Esmae. From June this year, Bing and his friends are going on tour in the first ever Bing stage show. Brought to life in a brand-new stage production full of fun, laughter, music and magical puppetry, Bing Live is the perfect first theatre trip for pre-schoolers and their families.